Although the Monarchs aren’t very good anymore, in the beginning they were one of the pioneers of the women’s game. 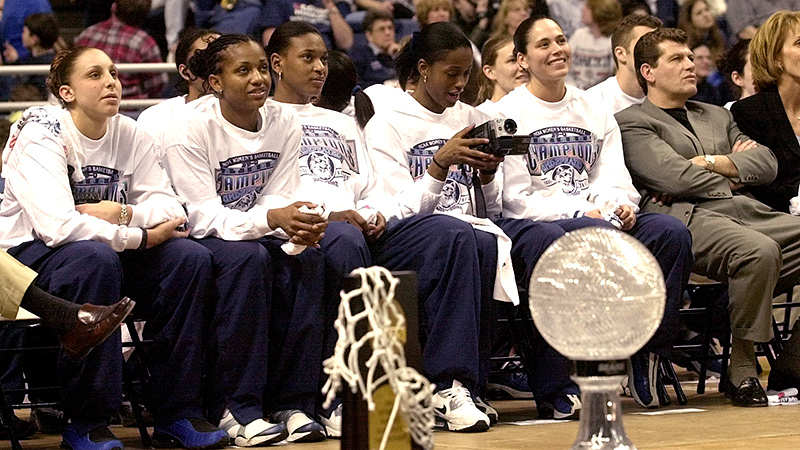 The program was one of the first to offer scholarships to women’s players and was the first to host a Final Four. Under coach Marianne Staley the team won two AIAW titles and in ’85 claimed their only NCAA crown with a 31-3 mark. They clinched the title behind tourney MVP Tracy Claxton with wins over-just to show you how much things have changed-Northeast Louisiana and Georgia. Today it’s been a while since the team made the tourney at all, but I hope its contribution to the game’s birth will continue to be recognized. In my men’s list I noted the 1957 Heels had a flair for the dramatic in the Final Four, and the same holds true for the women’s sole title as well. The ’94 lady Heels entered the Final Four 31-2 with their only losses two single digit setbacks to Virginia. The Heels comfortably defeated Purdue in the semis but all hope seemed loss when they were down by two to Louisiana Tech in the final with .7 seconds left. But .7 seconds was just enough time for Charlotte Smith to hit a stunning walk-off three to clinch the title. Sylvia Hatchell is one of the greatest coaches in the history of the game, but were it not for Smith’s shot she would just be the best coach not to win a title. The Boilermakers entered the Final Four with only one, one point loss on the road to Stanford, and once there left no doubt over who was #1 as they routed Louisiana Tech and Duke by a combined 31 points. Senior leaders Ukari Figgs and Stephenie White-McCarty ensured they would go out on top by spearheading a big second half run in the final after being down five at the half. It was a great sendoff for coach Carolyn Peck as well, who would leave the team to coach in the WNBA. Purdue would almost claim another title in 2001 but their last second shot against Notre Dame to tie wouldn’t fall. Today the team is a middle of the pack Big Ten team, but in their heyday they could play with anybody. The 80’s Trojans were akin to the modern day Huskies-wherever they went, a crowd would be sure to follow. The ’83 and ’84 teams were both champs but the 31-2 ’83 team was the best. The team broke 11 attendance records on their road trips and featured two of the game’s all-time greats in Cheryl Miller and Cynthia Cooper. The Trojans trailed by 11 at the half in the finals to Louisiana Tech but stormed back with a full-court press and a heroic effort by Cooper and Miller. When Tech missed its last two shots, the team could finally celebrate its first NCAA title. Eventually Stanford would overtake USC as the premier team in the west, but the Trojans can always say they were the first to set women’s basketball ablaze in California. This Cardinal team is, in my view, the best of the once-defeated champs in NCAA annals. Apart from one odd loss to Washington, the Cardinal was rarely challenged, winning by an average margin of 26 points a game and AVERAGING 92 points a game on offense. The centerpiece of the team was consensus player of the year Jennifer Azzi, who shot almost 50% from the field and 44% from three. Tara VanDerveer is still the Cardinal coach today and the team remains a national power, a down cycle these past two years notwithstanding. I mentioned there was a team that didn’t win a title on here, and now here they are. The 2001 Irish team delivered the school’s only title, but going into the 2014 Elite Eight this Irish team had the alluring promise of delivering an unthinkable perfect season. The team was supposed to be down with the loss of franchise pillar Skylar Diggins, but behind the big three of Jewell Loyd, Natalie Achonwa and Kayla McBride, they started 35-0 with their only serious scare a four point squeaker over #8 Maryland. All was going to plan against Baylor in the Elite Eight, with the team nursing a double digit lead with five minutes to go, when Achonwa suddenly suffered a devastating season-ending injury. The rest of the team deserves credit for taking heart and finding a way to demolish Maryland by 26 in the semifinals, but unfortunately standing in their way in the finals was archrival Uconn. Although not appearing on this list the 2014 Huskies were also one of the greatest teams of all time, entering the game 39-0 with all of those wins by double digits. The one thing the Irish could have done better is to not have stirred the pot via some choice words about Uconn from coach Muffet McGraw. The Huskies were already the favorite and now Geno had some bulletin board material to hype his players up. All this considered the 2014 finals was a big disappointment for the women’s game as the hyped matchup of unbeatens turned into a 21 point Husky rout. The 2014 Irish team is still one of the greatest ever, but fans can only wonder would could have been had things worked out differently heading into the title game. The ’86 undefeated Longhorns are a perfect example of a team that suffered a devastating loss in one postseason, only to come back stronger the next. The ’85 team entered the tourney as the #1 team in the country and the Final Four just so happened to be held on their home court. But tragedy struck when Western Kentucky hit a walk-off shot to eliminate Texas in the Sweet Sixteen. Demanding coach Jody Conradt refused to let her troops feel sorry for themselves with 12 players coming back, including six seniors. The team romped its way to the final by an average margin of 30 points a game, but waiting for them was none other than the same USC squad I profiled earlier. But this Longhorn team was playing in a league of their own and routed the Trojans by 16. No matter how many other teams go undefeated, this Texas team can say they were the first. Texas hasn’t been able to duplicate this team’s magic as of yet, but the team is building towards a title with the 2016 team being a strong contender for a #1 seed. The 2013 Bears were profiled in my ranking of most shocking march madness upsets, but no such tragedy befell the 2012 team, the first in NCAA history to finish 40-0. The 2010 and ’11 Bears were good, but couldn’t quite finish off a postseason run. But in her third try at a crown national player of the year Brittney Griner toyed with the opposition, racking up absurd numbers of dunks and blocks. With talented sidekicks Odyssey Sims and Destiny Williams helping out Griner’s team romped through their schedule with their only close call a five point win against #2 Uconn. By the time they got to the Finals it was a forgone conclusion the Bears would claim the title. In the finals against now perennial runner-up Notre Dame Griner asserted her will with 26 points and 13 rebounds in a 19 point rout. The Bears haven’t been back to the Final Four yet but are a contender to return this year and with a great recruiting class on the way there may be some competition in the future for best Lady Bear team. Seeing as I rigged this list so the Vols and Huskies can only have one team, it’s only fair they’re the two on top. The ’98 Vols remain the program’s only undefeated team. It was a fine team, but the path to the final was rather strange. Liberty also entered the tourney undefeated but for some reason they were given a 16 seed and had to play the Vols in the first round. Perhaps the committee thought it was cute to have two undefeated teams play in the first round, but it wasn’t much of a game as the Vols won by 44. Once the Vols got to the Final Four, they had the fortune of playing nine seeded Arkansas, the lowest seed ever to make the Final Four (Arkansas had the great fortune of not having to play #1 Stanford due to their loss to Harvard). That wasn’t much of a game either as the Vols stomped the Razorbacks by 28. In the finals the Vols seemed to finally have found a worthy challenger in old time power Louisiana Tech, making almost certainly their final appearance in the title game. But behind the star power of all time greats Tamika Catchings and Chamique Holdsclaw, the Vols had a 23 point lead at the half and there was no drama left. It’s hard to believe that with all of Pat Summitt’s accomplishments this was her only perfect season, but it’s still more than most of the field can boast. One could make a case for the 2009 or 2014 Husky team as the greatest of all time, but to this day Geno insists the 2002 team was the best so I’ll defer to his judgement. The ’02 huskies are extremely reminiscent of the ’86 Longhorns in that they bounced back superbly from disappointment. The ’01 Huskies were prohibitive favorites to win it all, so prohibitive that Geno guaranteed a title. But after multiple devastating injuries and poor play in the semifinals by freshman Diana Taurasi, the team blew a big lead to Notre Dame and went home empty handed. But the next season featured four senior starters who would be four of the first six picks in the following WNBA draft, while Taurasi would go on to win two more titles despite being pretty much a one woman team. The team’s average margin of victory was an astonishing 35 points a game, and only one team played Uconn within 10 the entire season. In case you’re wondering I see no need to revise this list later for this year’s husky team because the corp of the 2016 team is three upperclassman whereas the ’02 team featured four great senior leaders and a spunky underclassman who would become pretty good herself.